For the 12th time, Pegasystems was cited as a Leader and is positioned furthest to the right for completeness of vision and highest for ability to execute amongst 21 vendors evaluated. Gartner assessed the Pega® Platform, which we believe is the industry leading application development platform that unifies digital process automation and customer engagement—from end to end. "Intelligent business process management suites use actionable, real-time insights from operations intelligence to increase the agility and scalability of business operations. Application leaders building a DigitalOps competency can transform their business processes with these technologies." Pegasystems uniquely leverages digital process automation (DPA), including artificial intelligence and robotics, to unify business processes and customer journeys from end-to-end. Pega’s visually-driven, low-code development environment fosters collaboration between business and IT, enabling quick development of applications, faster time to value, and reduced development costs. When you bring together case management, AI, and robotics, you can automate everything from simple tasks to unpredictable processes. Think of it as your secret weapon for getting work done. This graphic was created by Gartner, Inc. as part of a larger research document and should be evaluated in the context of the entire document. 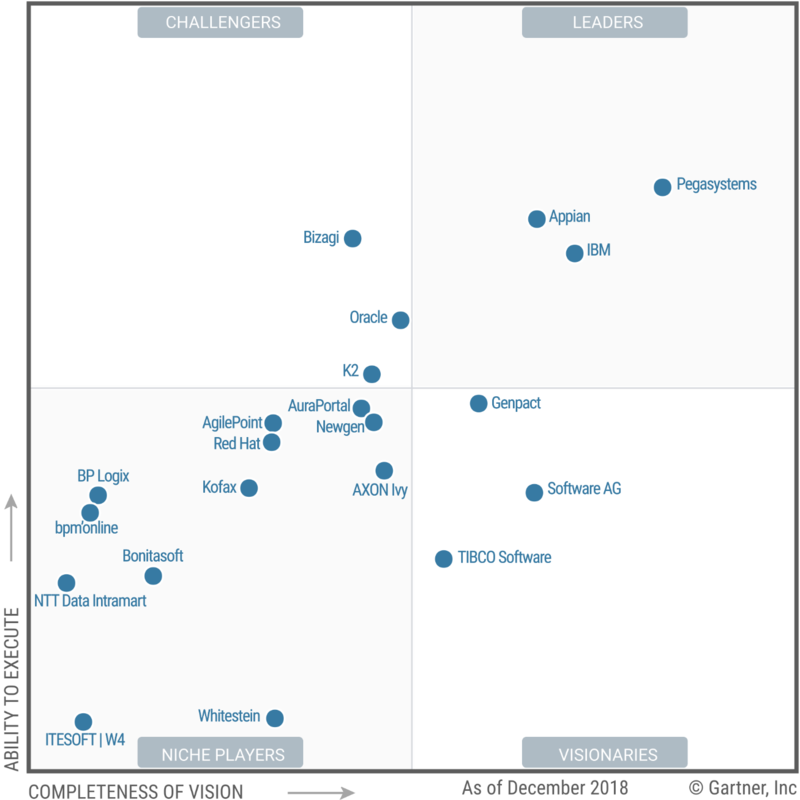 The Gartner document is available upon request from Pegasystems.